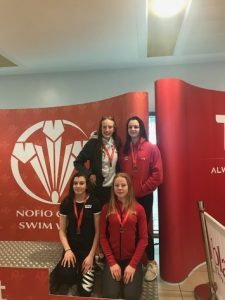 Swim Wales Welsh National Championships were held on the Easter weekend from the 30th of March to the 2nd of April, 10 Holywell swimmers traveled the 180mile trip down to Swansea. The team were in great form and spirits were high, our swimmers raced well with some fast solid swims. Notable swims from Katie Allen in the 800m Free, coming 8th and dropping 15 seconds from her Long Course time and 4 PBs. Ffion Austin 100m Fly taking 3 seconds off her time to go 1:09.71 and 1:02.42 in the 100m Free, Ffion made 3 Finals 5 PBs. Ethan Cameron came 9th in hard 1500m Free in 20: 00.58, posted a 100m Free time in 1:02.97. George Davies had a good swim, he was fighting off illness to post a LC PB in the 50m Brs in 32.78. Liv Davies winning Gold in the 50m & 100m Breast and Silver in the 200m Brs narrowly missing gold by a fingertip by 4/100th of a second, another Silvers in 50m Back & Bronze in the 200m Back and making 7 Finals. Both Bianca Feliciello and Sadie Lee did well, the girls have been working hard to get back to full fitness. Jean Luc Lovell-Pascal in the 200m Brs hitting a good PB time of 2:59.21 dropping 4.29 seconds and making the final and 2 PBs. Molly Martin won the 50m Breast Gold in 33.96 made 4 finals and 3 PBs (although not recognised Molly also won the 100m Brs Gold, explanation below) . Ella Williams was solid throughout the four days winning 3 Silvers and 2 Bronze, 5 Finals 6 PBs. Tomos Williams swam 4 races posting 3 PBs times. The team was disappointed for Molly who won her 100m Brs race but was disqualified for “going too early”, video footage from parents and footage from live streaming from Swim Wales clearly show Molly was good, it certainly appears the officials got this one wrong. Unfortunately, Swim Wales don’t accept video evidence in appeals. Disappointment for Molly and the team but I’m sure we will make amends next year. Relays:- Fast and always exciting, and this year didn’t disappoint. Day Two:- Ella Williams, Liv Davies, Molly Martin, Sadie Lee, came 6th in the 4 x 100m Medley Relay. Day Four:- Ella Williams, Molly Martin, Bianca Feliciello and Sadie Lee who came 7th in the 4 x 100m Free Relay. Katie Allen , Ffion Austin, Ethan Cameron, George Davies, Liv Davies, Bianca Feliciello, Jean-Luc Lovell-Pascal, Molly Martin, Ella Williams, Tomos Williams. Great job team, some super fast swims. From 14 Finals you won. 3 Gold (# 4 Gold with Mollys 100m) 5 Silvers, 3 Bronze.